Walter H. Beech formed the Travel Air Manufacturing Company in Wichita, Kansas, USA, in 1924. 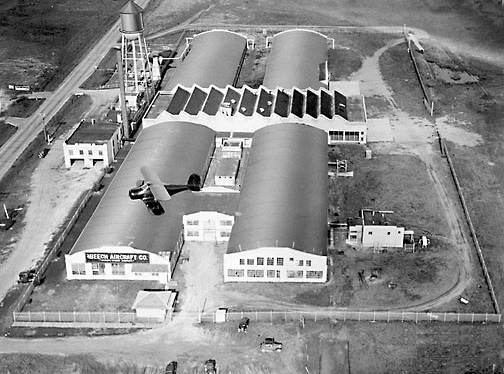 In 1932, Beech was back in Wichita with a handful of ex Travel Air workers, founded the Beech Aircraft Company, and set about designing a luxury, five-place biplane with a high speed of 200 mph, a touchdown not above 60, a range of 1,000 miles at a filling, and the comfort and grande luxe you might expect from the rarest and most elaborate sedan. The Company had Walter as president and his wife, Olive as secretary-tresurer. Beech's first Beechcraft flew on No-vember 4, 1932. Its official name was Model 17, simply because Beech's last project with Travel Air had been Model 16. Beech Aircraft Company set up shop optimis-tically in Wichita but suffered: only one aircraft was sold during the first two years. In 1934, however, sales picked up, and 54 airplanes had been delivered by the end of 1935. Walter Beech together with his wife Olive established the Beech Aircraft Corporation during 1932. In late 1950 Walter Beech died but in the 1980s, Mrs. Olive Beech remained in office as chairman of the board of the success story that has built some 45,000 aircraft. NOTE: Beech dash suffixes signified general engine groups: A = Wright R-760-E2; B = Jacobs L-5; C = Continental R-9A; D = Jacobs L-6; E = Wright R-760-E1; F = Wright R-1820; L = Jacobs L-4; R = Wright R-975-E3; S = P&W R-985; W = P&W R-985-SCG. Delivered the 10,000th example of its Beechcraft Bonanza Model 35 in February 1977, and the Bonanza celebrated its 50th anniversary in 1995, with production continuing. Company also supplied military aircraft, and became involved in the construction of aircraft and missile components and missile targets for the U.S. Army. Designed, developed, and manufactured the cryogenic gas storage system for NASA's Apollo and Skylab projects. Other work included provision of power reactant storage assembly for NASA's Space Shuttle orbiter. On 8 February 1981, after a share exchange, Beech became a subsidiary of the Raytheon Company but continued to be operated as an independent company until 1994. Hawker Beechcraft filed for bankruptcy in May 2012. The Wichita, Kansas-based company left court protection in February 2013 and exited the jet business with a pledge to keep servicing the planes. Textron Inc reached a deal to buy Beechcraft Corp. for $1.4 billion in December 2013. The Providence, Rhode Island-based company will purchase all outstanding equity interests in Beech Holdings LLC, the parent of Beechcraft, it said in a statement yesterday. The deal, which includes the repayment of Beechcraft’s working capital debt, will be financed by a combination of available cash and as much as $1.1 billion in new debt. Adding Beechcraft models such as the twin-engine King Air will complement a Cessna lineup that ranges from two-seaters to the Caravan turboprop. That market segment is less competitive than private jets, where Cessna has struggled because it doesn’t build the large, long-range planes now favored by corporate buyers. Textron will take over service for Hawker jets and hopes to convert those owners to Cessna jets, Donnelly said. The company is expecting low revenue from the T-6 military training plane as the U.S. military winds down it purchases and foreign sales of the plane would be a plus, he said. Of the aircraft in service, 6,400 are King Airs and 2,250 are Hawker jets. The Beechcraft business was in good shape even with the bankruptcy and Textron wasn’t expected to invest extra to fix it.